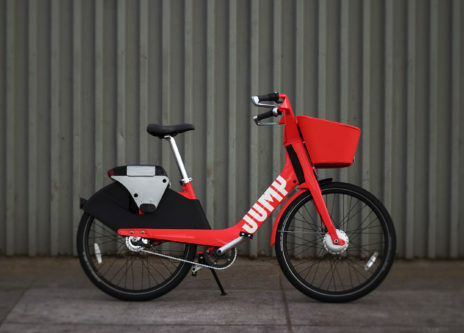 On Monday, Uber joined the Seattle dockless bike share game, with Jump-branded red ebikes. The initial service will feature 300 bikes in a limited service area, “then incrementally ramp up the number of bikes over the coming weeks and months,” according to a release. 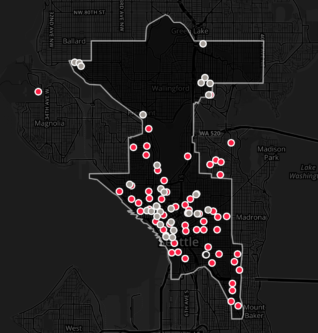 The rollout service area is limited to central Seattle, Ballard, Fremont, the University District, Capitol Hill, and parts of the Central District. The bikes will cost $1.00 to unlock, and $0.10 per minute during the ride. A launch promotion gives each user five 30 rides for free through December 12. A $5 per month, unlimited ride subscription model will also be available for low-income riders. The ebikes have some notable differences from their Lime competitors. Jump bikes have to be locked to a pole or bike stand at the end of a trip. The bikes’ activation and payment system is significantly different from Lime’s, and doesn’t require a smartphone. Lime’s system requires users to scan a QR code or key in a bike’s ID number on their smartphone. The phone then contacts Lime’s network and unlocks the bike. Jump riders can find bikes through the Uber app, which now features Jump as one of the modes available in its trip planning function. Right now, the very arbitrarily drawn service area includes many of the neighborhoods around the U-district, but excludes the UW Link Station, effectively prohibiting use of the Jump bikes for one of bikeshare’s primarily purposes – getting to and from the train. (The Jump website says parking outside the service incurs a $25 fee, but I’ve never actually tested it). It will also be interesting to see what happens when people try to take the Jump bikes to neighborhoods that don’t have bike racks (which pretty much exist only in commercial areas, not residential neighborhoods). My guess is there’s going to be a lot of people locking to fences, railings, trees, whatever they can find, or just locking the bike to itself, when there’s nothing to be found. There is also the concern that many neighborhoods which do have bike racks, the racks come in a very limited capacity (like 1-2 racks holding 2-3 bikes each), so if Jump expands, but the city’s bike rack capacity doesn’t expand with it, we could be in for a real space crunch. One of the big appeals of taking a bike somewhere, instead of a car, is that you don’t have to waste time circling around, looking for a place to park, and still end up walking half a mile when you finally do find parking. If Jump-bike parking ends up becoming a car-parking-like experience, it’s not going to be very attractive. (And, if Jump bikes clog up too much rack space, it similarly effects people riding their own bikes, although at least they might have options to park inside of buildings, which are unavailable to public bike shares). Per the Curbed Seattle article the City required JUMP to not enforce the lock-to requirement until March 15, 2019, to allow the City time to install more bike racks using the bikeshare permit fee money. I rode one this morning and easily locked the bike to a stop sign post, but I can see finding a suitable locking spot would be challenging in lots of places. To a sign post, eh? (e) Chained or otherwise secured to trees, lamp standards, railings, garbage receptacles, fencing, or sign posts. (2) Bicycle racks in campus areas are for parking and shall not be used for overnight storage, except for those racks adjacent to residence halls which may be used for storage when the owner/operator is a current resident of that hall. Bicycle lockers in campus are to be used for bicycle parking and may be used for overnight storage of a bicycle. I hope that the permit fees Seattle has instituted do cover the true costs, including enforcement, involved for these bike-share companies to continue to use ROW for storage of their respective fleets. Regarding my post above, it appears that Uber must know this restriction as the approved zone as it now stands doesn’t include the UW campus. If that were the case, how come Lime bikes are available all throughout the UW campus? Including the Link station. For the same reason they appeared in Kenmore and Bellevue outside the authorized zone and the cities hadn’t approved them. Saw a couple last night and one this morning on the BGT, curiously not locked to anything. Last I’ve heard, these bikes had the ability to go up to 20 mph with e-assist, which would make them illegal on the all of Seattle’s bike facilities, including the 5 trails in the 15 mph pilot program. Did Uber adjust that or can we expect Seattle to start fining Uber (haha, an American City actually following through on regulations for Uber)? It’s not illegal to have a bike that can go faster than the speed limit, it’s illegal to exceed the speed limit. Just like a car can go faster than the speed limit on any road. Bikes can ride on roads too, not just the bike trail. It’s not illegal to have a bike that can go faster than the speed limit, it’s illegal to exceed the speed limit. Just like a car can go faster than the speed limit on any road. Comparing bicycling culture to car culture is like comparing apples to oranges and is a dangerous precedent on which to base our bicycle rules..
Bikes can ride on roads too, not just the bike trail. I’d have no issues banning electric anything from our multi-use facilities while allowing their use on the street. In fact, that would be preferable to the half-assed grey area nonsense Seattle is mulling. I agree that Seattle can improve bicycling facilities to promote separation of cyclists and pedestrians. The reality is that state law permits electric bikes of all classes, including the Uber bikes, to operate on multiuse pathways. The reality is that state law permits electric bikes of all classes, including the Uber bikes, to operate on multiuse pathways. At the discretion of the local jurisdiction. If the state didn’t pay for construction or maintenance of the multi-use trail, they can’t dictate usage. Isn’t it still charging by the minute if it’s not locked in a vertical position? That seems to be the implication, that you have to lock it to something like a bike rack in order to check it back in. I read that Seattle apparently negotiated with Uber to delay the lockup requirement due to complaints (justified in my opinion) that bike racks in popular locations may get so clogged with Uber bikes that personal bikes won’t be able to use the racks. My understanding is that they will use Uber’s data to determine where additional bike racks are needed and spend Uber’s permit and usage fees on adding bike racks. If true, I am full support of this, but I’ll believe it when I see it. The multi-use trail pilot program allows “Class 1 and Class 2 bikes, which stop assisting riders at 20 mph.” Both Jump and Lime e-bikes are consistent with the requirements for Class 2. It’s up to riders (of both assisted and regular bikes) to stay within the 15mph speed limit. I tried one out for an hour while riding around downtown last night. The setup takes a little while on the bike, since it needs to verify your account number, but it’s otherwise not to slow compared to an app-based reservation. Better yet, there’s a hold feature that allows for an hour-long break in your ride/reservation! The bike itself does not check or scold you for whether or not the U-lock has been wrapped around a bike rack or suitable pole. In fact, the U-lock is quite small and it would be hard to lock it to most trees and streetlamp posts. The check-out process is definitely more complicated than Lime or Spin. There are several optional methods on the screen to check out a bike; I set up my Orca card. After getting it to read it, the screen said “Bike Reserved. Enter PIN#.” I mistakenly assumed that the bike was on-hold for someone else, or otherwise unavailable, so I walked on and found another JUMP bike. The second did the same thing, so I opened the app and found the PIN they assigned me. I typed it in, and heard the unlock. So even with an ORCA card, you need to key in your PIN to unlock a bike. Overall, the ride was very smooth. The bikes have a few nice features: good sized, deep baskets; very solid brakes; a smartphone holder; 3 gear settings; and graduated numbers of the seat post (so once you learn your height setting, it will be easy to adjust the height correctly). That sounds like a nice consumer-friendly feature. I wonder if the competition will follow suit. Lime’s scooters have the hold feature in other cities, so it really should have been added to the bikes. There’s no excuse worth hearing. This is going to be a problem. It’s already hard to find a place to lock a bike in some areas without these taking up limited space in street bike racks. SDOT says they’re using the permit fees to increase the number of bike racks and corrals by 20% in the next year. Oh great, bikes in a color I have significant trouble seeing at night, this is going to be aggrivating. Integrated brake cables that can’t be cut: cool. I wonder what weaknesses the vandals will latch on to. Driver, can I have the lift? Say my first jump bike in the wild at a homeless encampment this morning.